Vantage 35 is close to the ideal pack size for a long day! Vantage 35 holds all the gear you’ll need for a long day, any time of year. 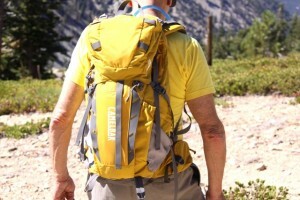 Some brands get better, year after year, and the Camelbak Vantage 35 is a strong example. The Vantage 35 M/L is the specific backpack we assessed over several months of various uses, mostly in alpine terrain. Citronelle and Woodbine are the color combination. Total cargo capacity is stated at 40-liters (2441 cubic inches), enough for most any long day hike with the potential of being a good option for an overnight bivouac when you choose your gear list concisely. MSRP is $149.00. No doubt, some upgrades have been designed into the Vantage 35 nudging it closer to becoming a standard back country piece of gear. Yup, it we think the Vantage 35 is a comfortable and reliable four-season packhorse. Onboard hydration is the new, and thankfully so, Camelbak three-liter (100 oz.) Antidote reservoir running the well thought out Quick Link water hose-to-reservoir connection system. The Quick Link system is worthy of note because you can change out the water line from the reservoir instantly; switching to a insulated hot/cold weather water line or breaking the reservoir system down to air it out in between adventures. CamelBak Vantage 35 getting trail time. serve to hold the wide-mouth fill port open to assist airing out the reservoir when not in use. HydroGaurd technology and the PureFlow tube are features built into this Antidote three-liter res’ and can also be found in CamelBak’s new Stowaway and Unbottle reservoirs. Both of these new for 2012 Camelbak reservoirs have also occupied the reservoir compartment of this particular Vantage 35. And of course, the Big-Bite water dispensing mouthpiece, common to all the above mentioned CamelBak products, work fine every time. And it doesn’t seem to be an unreasonable stretch to assert that the advances in technology applied to the Antidote Reservoir are one of the most important upgrades you will enjoy should you choose to invest in the Vantage 35 M/L. Hey! Either throw your money away on another tank or two of gouging U.S. gas prices or “invest” in a piece of kit that will last thousands of miles rather than a couple days commuting to your white collar slave station on Park Avenue. NVIA ventilated back panel, hip belt, and shoulder harness system worked well. At an empty weight of 3.24 pounds, the Vantage is a sturdy pack. The composite hardware buckles, strap-gauge, harness assembly, hip-belt and harness padding, are all pretty robust and adequate for any duty this pack might see. The Vantage 35 pack has to be sturdy enough to support enough weight to potentially take enough gear to support the hiker for a full day or overnight stay. We think a good case could be made for either length of journey. There are plenty of lash points on the exterior of the Vantage 35 to support gear you’ll want access during a hike. 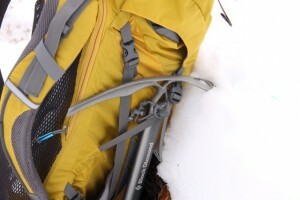 Elastic fasteners and web loops allow you to secure an ice-axe, crampons, and other gear you’ll need for sections of trail and load back up without the worry of shredding holes in the pack. The outer pocket at the front of the pack works well for stashing you morning layer such as a light down jacket and fleece sweater. This pocket expands and compresses according to how you use it. On the lower right side (facing you), there is a side-zipped access point for digging out gear that might be down at the bottom of the Vantage 35; something like your stove, cook kit, gas bottle, and…lunch! Sandwiched between the frame sheet and the main cargo hold is the reservoir compartment identified with a blue-anodized zipper tab. All other zipper tabs on the Vantage 35 are anodized gold. Lashing points and elastic fastening aids keep hardware secure. The top pocket is large enough to store the small items you’ll want access to during a hike. This top pocket is not removable, and we’re thankful for that as it applies to this pack; it’s one less thing that can inadvertently be left behind or come apart. It’s a top-loader pack with good access. 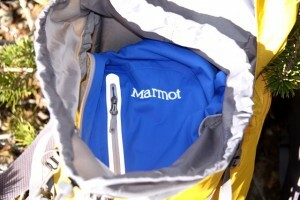 The main compartment drawstring keeps gear in place and allows for a slight amount extended load. For example, once a down jacket comes out of the stuff sack, and will likely be needed again, the pack-top drawstring allows you to store the jacket in the top of the pack, compress it, and continue without the drama of bulk or bulge. In our experience, if we couldn’t fit the gear we needed for a day hike in this Vantage 35, it was our fault. The Vantage 35 is as close to a long-day-hike or approach pack as we could ask for. Not to say other pack brands are not just as dialed in with pack design vs. application specifics, but the Vantage 35 seems to hit the target on form and function for a sturdy mid-sized pannier for most any two-legged trail horse. Blue zip tabs for water pocket. Gold zip tabs for gear. This pack, its design, and its sturdy build lends itself to rough use while keeping your gear squared away. We like that about the Vantage 35. And we can appreciate how much the product planning and design teams at Camelbak have learned and applied to their packs. This is not so much a compliment to Camelbak, but merely an observation from watching this company throughout the years perfect their core competency and product line (hydration systems), yet logically expand product expertise to include backpacks to the point where Camelbak products meet military standards and testing. Military standards and product assessment testing are big challenges to meet for any product. Under load and on the trail, the well padded N.V. I.S back panel, hip-belt, and shoulder harness system work together in combination for day-long comfort. 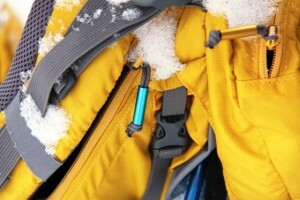 These, along with the sternum strap keep the pack load from shifting and keep things comfortable. The shoulder straps are contoured well and padded enough to handle any weight-load you might buy into for the day. When wearing several layers and/or a down jacket, the shoulder straps are forgiving and allow decent adjustability to accommodate different apparel layers. As a harness system, the Vantage 35 tends to mold to the contours of the back, lower back, shoulders and hips. This is an asset when you really need to use your hands, maintain your balance, and buckle down to whatever terrain feature you are traveling on. A centered compression strap cinches down on main pack compartment to secure gear from top to bottom of the pack. keep things tight, and allows you to focus on getting to where you want to go without shifting, chaffing, or otherwise causing you to continually adjust the fit to get comfortable. 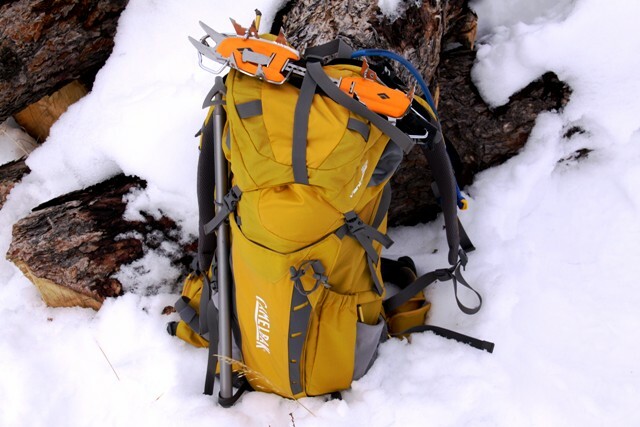 The Vantage 35 fits great for a torso length of 20- to 23-inches according to the specific pack and model we tested. Fabric choice for the Vantage 35 appears to be solid. The nylon fabrics Vantage 35 uses are 210 Micro Rip, 230D Taffeta and 420D. To assure cargo stays relatively dry, 1000-milimeter of polyurethane coating (PU) works with a durable water repellent (DWR) to shed wet snow and moderate rain. Since late August of 2011, this Vantage 35 has been used for weekend day hikes above timberline on the trails of the Sierra Nevada, San Jacinto, Mt. Baldy, Thunder Mountain, and sections of the PCT above Big Bear; all in the great state of California. Then as winter was setting in on the Rocky Mountains of Colorado, well, the Vantage was relocated to a new home above 7,000 feet elevation, just as the first snowstorms where fixing to pound on the high country. The Vantage 35 is a top load pack with extension capacity if you need it. 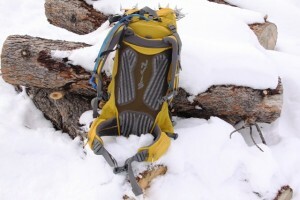 Vantage 35 is an excellent approach pack for hauling hardware, rope, crampons, ice-axe, insulation and nutrition. And it’s a sturdy all around day pack or a go-to overnight backpack that is capable of sustaining you, your water supply, and your essential gear. Possibly the notion that the Vantage 35 has so many hike-type applications is why it tends to get used more often on this Colorado adventure. For winter precautions, this Vantage 35 goes in the four-wheeler on many trips down the canyon roads, functioning as a slide-off pack. A slide-off pack is a survival list of insulation gear, water, first-aid, and food in the event of spinning out or off an icy road/highway into a ditch or canyon. It happens more than folks want to admit. And having enough gear on-board during the winter to help you hold out until help arrives is small assurance, but assurance nonetheless. So this Camelbak pack is also charged with a winter job holding most of the same gear it does on a spring alpine trek further up the mountains. In its winter-duty configuration, the uninsulated Antidote reservoir gets swapped out for either or both of Camelbak’s two new big water boys, the 2012 Stowaway and the 2012 Unbottle. Both of these new Camelbak reservoirs are insulated to keep the main water bladder from freezing in low temperatures. We’ll be reviewing these two new three-liter Camelbak reservoirs in the near future. But know this: both come as highly recommended as does the Vantage 35. With a full three-liter reservoir in the pack, the typical gear list for mild weather would include a well-stocked Adventure Medical Kit; Cloudveil down parka; Mt. Hardware Hydra gloves; Seirus glove liners; FITS heavy wool socks; REI eVent shell pants; food for two days; Mammut headlamp; Marmot soft shell; and 100-feet of 550 chord, additional water. For this winter, a Mt. Hardwear Conduit SL parka bumps the Cloudveil (and takes more room); Gordini Storm Trooper gloves are added to the lighter gloves, wool beanie and Cold Avenger soft shell mask, food and extra water in stainless steel bottles. Blue zipper tab for water. Gold zipper tab for gear pockets. 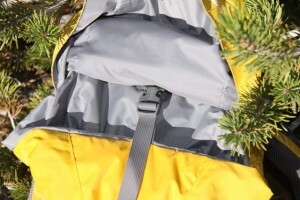 Pack top pocket is large enough to hold essential trail gear. Top loader offers easy entry, and access to main compartment on the lower right side. Back panel webbing, design, and performance on the trail made for comfortable hiking. No downsides to report on Vantage 35. Vantage 35 worked fine as a four-season approach and long hiker pack. Big Bite valve on trail is held secure with composite clip on shoulder harness. Worked fine. With temps in the single digits, we also tested the Camelbak 3-liter Stowaway and Unbottle reservoirs. Note: Three water tubes hanging out. Pockets on the hip belt are usefull for small items like hard candy, wallet, keys, bear repellant, etc. Harness system, hip belt, sternum strap, and well designed back panel all make for a nice long-haul day pack. Big Bit drinking valve is great for right handed folks. Left hander’s can adapt. No worries. The Vantage 35 is a top load pack with extention capacity if you need it. Three-liter Antidoe on left v. 2-Liter Camelbak reservoir on right. Sternum strap worked in harmony with the harness system.